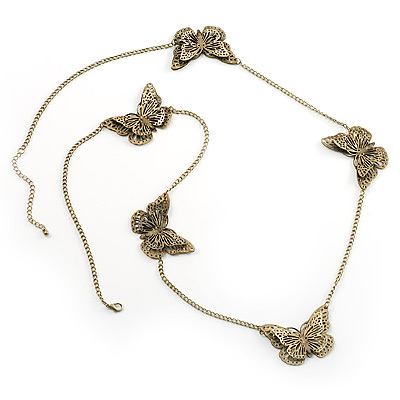 Complete your outfit in style with this Long Antique Bronze Butterfly Necklace. Featuring a long design, comprising of 5 dimensional butterfly's evenly spaced on a bronze tone rolo chain. Antique bronze-tone finish provides vintage appeal. Lobster-claw clasp guarantees a secure fit. Sweet and stylish, this long butterfly necklace looks gorgeous with any outfit.